Sunday night at the 87th Annual Academy Awards, Jared Leto had the enthusiasm of about 94 Left Sharks. He was SOOOO excited to be there, guys. 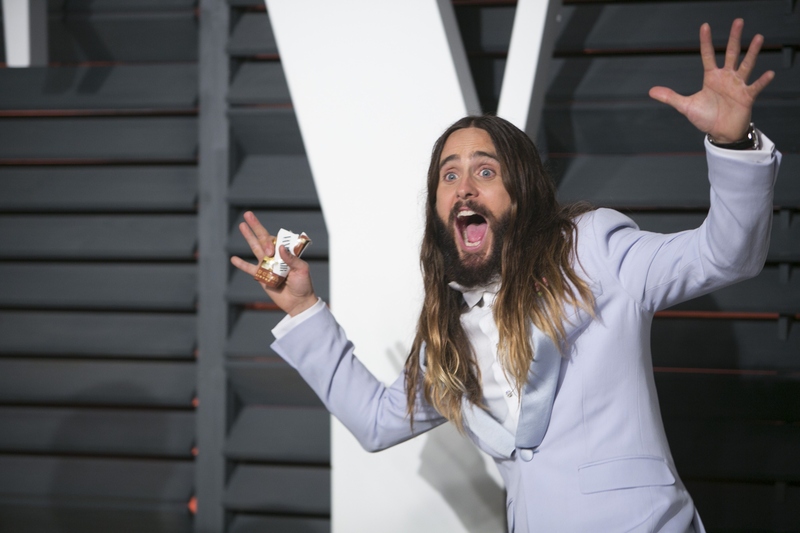 Not to make this a contest or anything, but Jared Leto had more fun than anyone Oscars. Need a hype man for your next corporate event or family party? He's your guy. Perusing through the snaps of the festivities, you can see that Leto was literally an irrepressible ball of euphoria amongst a sea of pretty people playing it cool. On the red carpet he gave a million thumbs up like the human emoji he is. In pretty much every photo he took with another celebrity, his eyes were buggin’ and he was sticking his tongue out Miley Cyrus-style. You thought the Anne Hathaway photobomb of 2014 was great? Get excited. He gifted us a bevy of magnificent photo bombs this year at the Vanity Fair after-party, for which I feel entirely unworthy. Perhaps that periwinkle suit boosted his morale, but something REALLY put him in a great mood before, after, and during the show. Whatever special happy elixir he was drinking, I want some. Let's run down Leto's moments of joy from Sunday night, because dude was hamming it up like ham was going out of style. He literally just CAN'T with all of the amazingness, right now. On a scale of 1 to 10, he rates his experience of this awards show a 35. Can i get this image screen-printed on a slanket and wear it around forever, please?? His prankster athleticism is astounding. Wanna see his Birdman impression?!?!?!?! Guys!! You said we were doing a silly one!! This picture is my theory of everything.